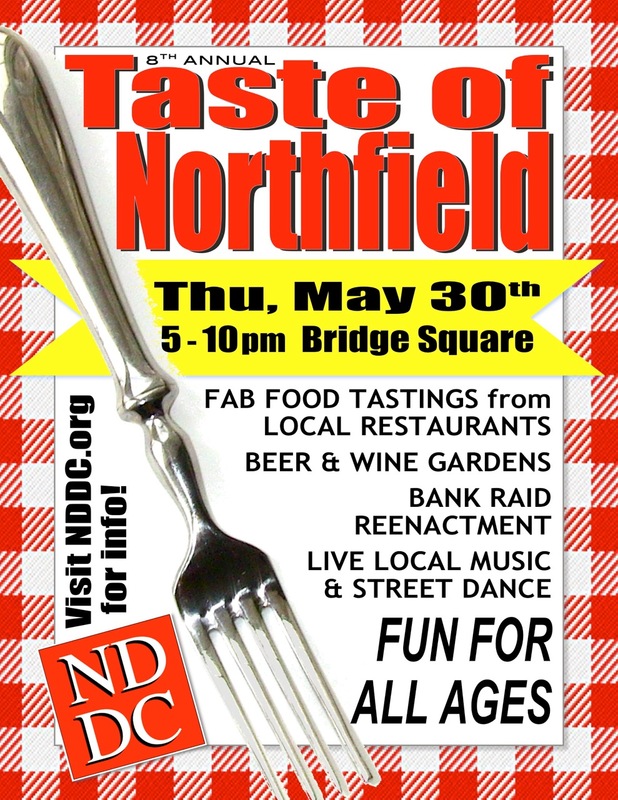 The 8th Annual Taste of Northfield, Thursday, May 30th, 5:00 to 10:00 p.m., Bridge Square, Sesquicentennial Legacy Plaza, the Cannon River, in downtown Northfield. The vendors: J. Grundy’s Rueb’N’Stein, The Contented Cow, Chapati, Quarterback Club, The Tavern, The Ole Store Restaurant, The HideAway, Domino’s, MOM Brands, CakeWalk, Carbone’s Pizza, Spring Creek Grill, and The Grand Event Center. The Cornerstone Sponsors: Archer House River Inn, Carleton College, City of Northfield, College City Beverage, Convention and Visitors Bureau, First National Bank of Northfield, KYMN, MOM Brands, Neuger Communications Group, Northfield News, and Rebound Enterprises. The Corporate Sponsors: By All Means Graphics, the Cowles Family, The Grand Event Center, and Northfield Liquor Store. The Business Boosters: Chapati Cuisine of India, Community Resource Bank, The Contented Cow Pub, Defeat of Jesse James Days Committee, Franek Electric, Heartman Insurance, Hogan Brothers Acoustic Cafe, Northfield Lines, J. Grundy’s Rueb’N’Stein, Northfield Historical Society, Northfield Patch, Northfield Police Department, Rick Pavek Construction, Taylor Truck Line, Upper Lakes Foods, and Waste Management. The artists: 5:00 p.m., Anna Balfany; 6:00 p.m., Bridge Square Band; 7:00 p.m., Raid Re-enactment; 7:30 p.m., Bicycle Auction; 7:45 p.m., The Lost Boyz Crew; and 8:15 p.m., Why Not (in the beer and wine tent). The 8th Annual Taste of Northfield is proudly brought to you by the Northfield Downtown Development Corporation (NDDC), our generous sponsors, our supportive partners, our valued business partners, and our amazing volunteers. Thanks to everyone who helps to make our great downtown happen! Had so much fun at the Taste of Northfield. Would like contact info for Why Nots.